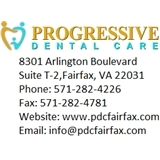 Progressive Dental Care (Fairfax) - Book Appointment Online! Progressive Dental Care is a family dental practice offering cosmetic and general dentistry with special emphasis on sleep apnea. The practice uses state of the art dental technology such as carivu and digital X-rays. Awesome service as always! I've been a patient for 2 years and I've never been disappointed. Dr. Mahajan is always patient, prepared, efficient, precise, respectful, and extremely knowledgeable! Great dentist!